The village pond is like the community sabbath of the old times. 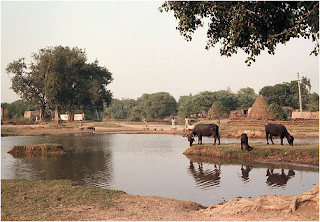 A community pool, often behind the village temple, with a Banyan tree on its banks, providing a shade by the virtue of its bounteous canopy, large enough to accommodate the local 'chaupaal' while still leaving space for 'khunte' to tie the water buffaloes after their swimming routine. Besides these it also serves as the source of water for the religious ritual of pouring water at the sun, a playground for the kids and mostly as a sanitizing buttock-wash during the early hours, if you know what i mean. Those who have always lived in the urban might say it is unhealthy, but in reality it is a great reason behind the sturdy health of village folks;it helps build immunity. One of our favorite mango-time games involved the village pond. The preparation was done by pouring buckets and buckets of water under the banyan tree so as to prepare a muddy ground leading right from the pond. And then the game started. We came running from a distance towards the pond, then held on to a hanging Banyan beard and finally slipped our ways through he mud, splash into the pond. Call it 'Desi-skiing' if you may. It's only to be experienced!